As we have mentioned in our previous issue1, there is a resistance to change in the construction industry, a stance not tolerated in other industries. The excuse mostly revolves around the following statement: When it comes to a building’s actual construction we have been limited by the great costs associated with non-standard components and labor. In academia though, many applied research projects and experiments are pursued on the issue of automation in construction. This may well be the reason that digital fabrication yet has an impact on the area of off-site prefabrication, a process in which smaller components of a building are made in a dedicated factory and then transported to the building site for final assembly. However, the autonomous fabrication of buildings (or building components) on the spot, generally referred to as in situ fabrication has a long way to reach to the level of automation compared to other industries. For some architects, this needs to be tackled with due to the breakage of the digital process chain between design and making. In response to this conservative and sometimes fragmented building industry, some architects believe that improving and automating the construction process essentially calls for either using experimental materials and components, or assembling them in experimental ways. And some others believe in the necessity of automation in the field of construction within the scope of occupational health and safety standards. All in this issue! Automating construction processes is certainly not a new topic. First construction robots had been designed in the beginning seventies in order to increase the quality in prefabrication of modular homes in Japan. Ideas from automobile manufacturing, ship building and the chemicals industry were adopted by the construction industry. Companies such as Toyota lead the way for automating construction processes. The robots were introduced to the building sites to carry out specialized tasks such as spraying, smoothing concrete, distributing materials, fitting equipment to ceilings, assembling form-work, installing facades, painting and many more. In this issue, we will be focusing on the close relatives of ‘orange’, the digitally controlled mobile industrial arms for on-site manufacturing, assembly and digital fabrication. There are a number of research projects aiming at enabling mobile robots for on-site robotic construction. Robotic arms borrowed from their neat and sterile environment and introduced to the construction site that is unstructured, constantly changing, relatively dirty in its nature; on top of that, applying classical industrial automation approaches in construction site, it is no surprise that a significant breakthrough is yet to be achieved. The first case study we would like to explore is a 1:1 scale; a prototypical demonstrator built as a part of a master course2 at ETH Zurich and the timber construction process. Current timber manufacture lines utilize CNC technologies for subtractive processes to precisely manufacture small components. They are then assembled manually into larger components. According to Eversmann, Gramazio, & Kohler, a break of the digital chain between design and making occurs exactly before spatial and functional building parts are assembled.3 This can result in a loss of information and precision in the digital process, but also in unexplored spatial, constructive, and fabrication potentials. To experiment the continuum of the digital process, a robotic setup was built to fabricate the structure and the envelope of a double-storey hut and then assemble it on-site. In order to identify and act up on the unprocessed material of various sizes, an adaptive feedback control system was installed. Among with the two industrial robots on a double carriage linear axis, the cell features a material feeding station, a parallel pneumatic gripper for centering and fixing material during the saw cutting procedure, a CNC saw equipped with servo motors for three controllable axes, and a custom designed worktable with integrated aluminum rails used for fixating wood structures during build-up. When it is the matter of producing 4000 different pieces, of course we do not question the need for the establishment of such an interactive set-up. The sequence for prefabricating the structure of this two-story hut is as follows: Slats are placed on the assembly table and the robot moves in its home position. Then the robot grips the beam and moves it towards the saw, where it gets cut as programmed; finally the beam gets placed in the truss, where it is fixated manually. The measurement data, geometry calculation, adapting the process in between the digital and physical model within small tolerances required a smooth algorithm to grip, cut, drill the material at certain angles… or move to beam specific cut length, and then to a precise location to be fixated… But over 4000 differently shaped elements could be assembled in only 5 weeks including testing and on-site assembly. We wonder whether the construction site would ever be so structured. 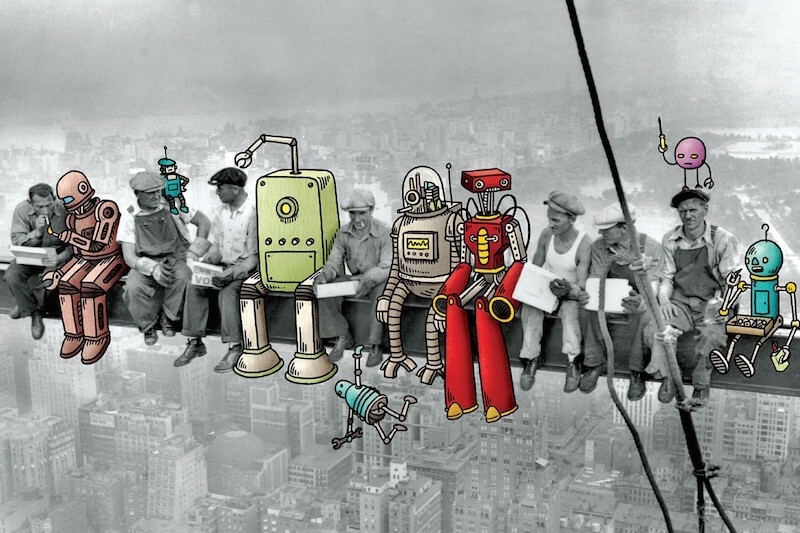 Maybe, the collaborative robotics will shine exactly at this point; construction workers carrying out the cognitive tasks whereas robots executing these tasks precisely. No more as-built drawings, no more cover-ups in later stages of constructions, no more missed deadlines, and a more humane working environment with robots. Well, it really is far different from the Skynet we were promised. Robotic arms welding the metal panels of The “Cloud” at Mocape Screenshot from Video. In order to improve the construction process, Wolf Prix is amongst the people who think assembling components in an experimental manner is the way to go. For their project Museum of Contemporary Art and Planning Exhibition (MOCAPE) in Shenzhen, they would use robots to assemble the interior façade of its central circulation volume referred as Cloud. Working with China-based curtain-wall technology company MSC, they utilize off the shelf components that are recognizable from any heavy manufacturing assembly line. The procedure is as follows: First, a mechanical press forms the panels. They’re delivered to the construction site, and articulated robot arms that have been lifted onto mechanized crane platforms then place, weld, buff, and shine them with an integrated end effector. Even tough, the client canceled the robotic-fabrication plan for The Cloud, opting instead to install the custom-designed metal panels conventionally, it is an important fact that experimenting with these methods in a country with already low wages might be an indication that this really is an efficient method of construction. There also lies another bitter truth behind this story, if such well-known architects with millions of square meters of building in their portfolio, cannot persuade the construction companies or clients to implement robotic assembly processes in the construction site, then we might as well keep on rolling in the sand pool and call it a victory to get an ephemeral pavilion constructed. Sketch of the real world rehabilitation site with two robotic units during the automated removal of asbestos contamination. Not much like the real world. As seen in the sketch, each unit consists of a mobile platform and a robotic arm with an abrasive tool. The environmental perception and local monitoring of the tasks are carried out by a combination of optical and radar sensor systems. And finally, there is a user interface where the operator can select different areas on a virtual representation of the rehabilitation site and assign tasks to be executed autonomously. In the consortium of Bots2ReC project that is supported by the EU Horizon 2020 research and innovation program, there are seven companies with different expertise (no architect involved). This robotic system is expected to fulfill its mission in places that are not very similar to the sketch, the real world spatial data (70-80 cm wide corridors, small spaces) will be considered as the reference defining the limitations for the footprint of the updated robotic system. It will not be a project based on the shiniest render nor the most viral animation that will be the breaking point for robots in construction. It will most probably be the solution that we are in dire need that we cannot see yet as we are all allured with all the exciting possibilities. Harder, better, faster, stronger7 – robots excel at tasks concerning safety, repeatability and high precision. As designers we are not tasked to develop novel mechanical designs nor innovative kinetics for robots, but rather we must be involved in the material manipulation. It is totally acceptable for designers to experiment with generic kinetic manipulators such as industrial arms for the time being. However, if we are not involved at all in the development process of future construction robotics; we will always get an over-engineered solution only for the task at hand that will be irrelevant for other cases. For more on the topic, refer to Does Orange Dream of Electric Brick? published in 2017 May, XXI. Master of Advanced Studies in Architecture and Digital Fabrication of the NCCR Digital Fabrication. Eversmann, P., Gramazio, F., & Kohler, M. (2017). Robotic prefabrication of timber structures: towards automated large-scale spatial assembly. Construction Robotics, 1-12. Detert, T., Eddine, S. C., Fauroux, J. C., Haschke, T., Becchi, F., Corves, B., Guzman, R., Herb, F., Linéatt, B., & Martin, D. (2017). 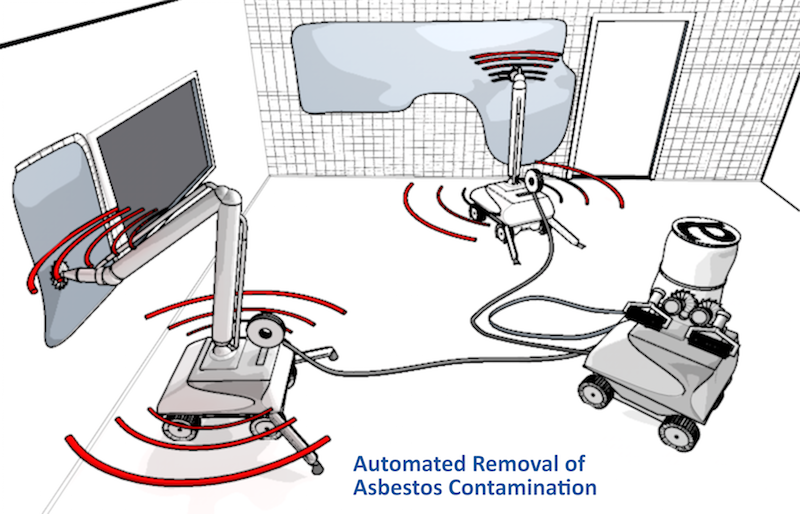 Bots2ReC: introducing mobile robotic units on construction sites for asbestos rehabilitation. Construction Robotics, 1-9.